I’m on a West Coast swing this week that will finish with a talk at Fullerton College for their 100th Anniversary Futures Conference (seats are still available for anyone in the area). The trip got off to the right start with a cup of coffee with one of the founders of Accredible (the folks behind the portfolio system I used to document my One Year BA). 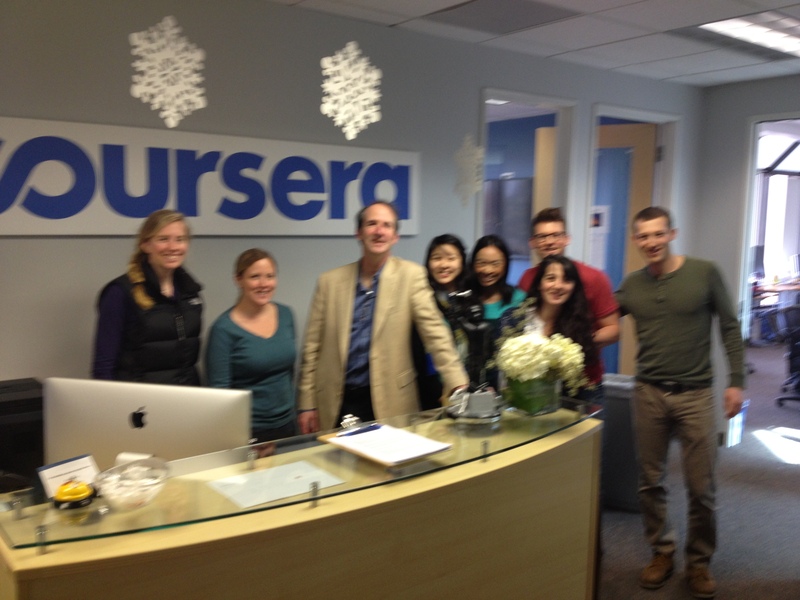 And after that, it was on to see where the magic happens with a visit to Coursera (who were nice enough to schedule me for a lunchtime talk with their staff). You can see from the photo above that fun was had by all (especially me). And in the land of beanbag couches, standup desks and free flowing food and conversation that I love so much about the West Coast startup scene, I had the chance to meet almost everyone I’ve been in touch with or know of or about at the company, including its founders Daphne Koller (who I got to shake hands with on her way to Mexico) and Andrew Ng (also the guest on this early podcast interview). And speaking of interviews, I was planning to record my conversation with another fellow I met in the Bay Area, Archie Abrams, Director of Growth for the learning marketplace Udemy. But the place we met was Noise Central, so he and I will be doing a separate recorded interview from the quiet of our offices for release next Friday. Anyway, time to get this posted so I can try to recall how I ended up in San Diego (under circumstances suspiciously similar to the time after completing my original BA when I woke up in Scotland) and figure out where Fullerton is from here. 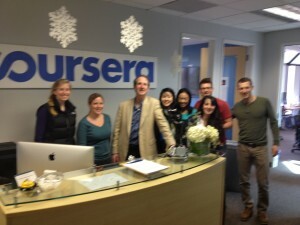 Full report (as well as thoughts on Coursera’s new Specialization program) next week.